While a well manicured beard is a symbol of power and prestige, an unruly and disheveled beard has the potential to lead society into complete anarchy. 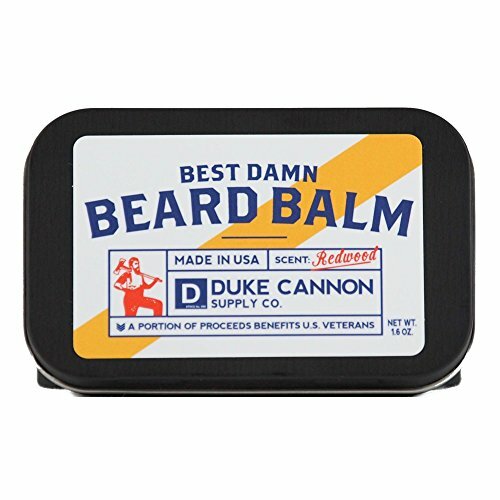 Duke Cannon's Best Damn Beard Balm is designed to tame the beast while moisturizing and protecting both the beard and that face (it's there somewhere) underneath it. Comes in a masculine, black matte tin for easy travel and daily use; unlike those dainty circular tins, this package clasps shut. The pleasant woodsy fragrance is like a portable Redwood forest. Made with natural/organic ingredients like Lanolin, Beeswax, and Cocoa Butter. ** Disclaimer: will NOT protect against bacon crumbles, rogue wood chips, or runaway squirrels already living inside your beard. * A portion of proceeds benefits U.S. Veterans. PLEASE NOTE: Because we use all natural ingredients like Beeswax our Beard Balm is susceptible to extreme heat and will melt. If you have any questions about this product by Duke Cannon, contact us by completing and submitting the form below. If you are looking for a specif part number, please include it with your message.